What first drew you into music production and Funk/Nu disco in particular? Honestly, I can’t remember. I was just a child when I first started recording my own music and this was during a time when home studio recording for the average Joe was non-existent. I remember using an old Panasonic dual cassette boom box to overdub tracks from one cassette to the other, and back again. The sound quality was horrendous as the tape hiss just worsened with each overdub. It’s ironic, back then I literally generated drum tracks by hand drumming on the back of my acoustic guitar, now I do the same thing but on an NI Maschine Studio. Then somewhere along the way I saved up enough money to get a Korg M1, which had a built-in sequencer, and my electronic recordings took flight from there. As for my attraction to Funk and Nu-Disco, I have to blame the guys in my old band “Numb” for this addiction. The drummer was really into Funk Rock bands like Primus and the Red Hot Chili Peppers and convinced us to play some of their material in the clubs. I remember looking out from the stage in awe of the energy these songs created on the dance floor. At that point, I was hooked. “Gual” is a very unique producer name, how did you choose that name? Any special meaning behind it? My original plan was to call myself Tiesto but later found out the name was already takenJ Besides, it wouldn’t have been fair to him had I stolen all 17M of his monthly listeners and forced him back on the street. All kidding aside, I actually didn’t choose the name Gual, it chose me. My last name is Gualtieri, which is a bit challenging for a non-inebriated American to pronounce, so growing up my brothers and I were always called Gual, for short, by our friends – I guess it was much easier for them to say and took less effort of course. By the way, Gual rhymes with the word “wall” but with a hard “G” sound in front of it. I think it’s hard for any writer/producer to categorize their music; I really like to produce funky sounding dance tracks that blend retro style musical elements with today’s electric sound. I always tell people my sound is a reflection of me – a little off beat, a little straight forward, and 100% just for fun. But if I had to choose a specific genre I’m closest to it would be Electro House. I really like the artistic license granted to the producer by the fans of this genre. If they like it, they dance, no questions asked. There is no approved template you must follow. There is no interest in judging the appropriateness of the lyrics or the choice of sounds used in the track. And best of all, there is no hidden agenda designed to generate anger or entice violence on a political horizon – it’s always positive, uplifting, and joyous. Your latest track “Can You Feel It” is your best track in our opinion! From its artwork to the Incredibly powerful sound we absolutely love it. Could you tell us more about the story behind this track? Also what is your creative process like? Thank you for the kind words! They mean more to me than you know. I try to record something new everyday, depending on how I’m feeling – kind of like a musical diary entry of my day. If I’m in a silly mood one day I may write a funky slap bass riff. Maybe the next day I’m feeling a bit more energetic so I write an intense drum beat, or a mesmerizing synth arp, or whatever. And as I’m writing and recording these random musical thoughts each day, I save them in my DAW software (the diary), morphing them together until they start to adopt their own collective identity. Then, much like an OCD Harley Davidson owner polishing every square inch of chrome on his bike before he takes it out on the road, I tweak, hone, rearrange, and nitpick the thing until I’ve totally saturated my enthusiasm with it. That’s when I know a track is done! So you can think of the music as a summary of my emotions during the time it was produced. Now, if you listen carefully to “Can You Feel It” you can hear the day I was jazzed up about Soca music or the time I was inspired by Nile Rogers’ disco guitar sound or the moment Armin’s synth layers got me dancing around the house in my pajamas (well, maybe not that one). I’d venture to say there are at least a dozen different emotions captured in that track. It’s my hope that as you listen to it some of the energy I felt when producing it transfers to you for your enjoyment in whatever dance form you desire. I try to avoid maintaining quantifiable goals for the future, which is hard to do in this age where success seems to be measured by the size of your “anti-social media” follower to following ratio or the presence of a blue check mark next to your image. However, I do have a long-term goal (maybe it’s really a milestone), that is to one day create an entire DJ set interactively with the people on the dance floor. I have this vision of passing a wireless mic around, recording their voices in my sampler, converting them to MIDI tracks, and looping the triggered sounds into a real-time dance track. In effect, the listeners play the instruments and the DJ works as the orchestrator. I can only imagine what this would sound like. Good or bad, I guarantee it will be a lot of fun! What are your goals for the new year? Any upcoming projects we can get excited about? Other than trying to persuade Pasquale Rotella to let me open up EDC in Orlando this November J my goals for this year are hopefully realistic. Given the fact that the shelf-life for the typical dance track seems to be about 8-12 weeks, I find myself to be in constant production mode with a bad habit of removing previously released tracks from all digital streaming platforms. This is why you don’t see many of my tracks out there. So one of my goals this year is to convince myself that although my best work may be yet to come the tracks of the past represent my growth as a dance music producer and should be better preserved. Therefore, I intend to collect all of this year’s dance tracks and put them on a pressed vinyl album. Now, I may be the only one buying this album so I’ll probably just frame it and put it on my wall and pretend it went gold. Another goal I have for this year that I’m super excited about is to complete a performance video for one of my tracks. 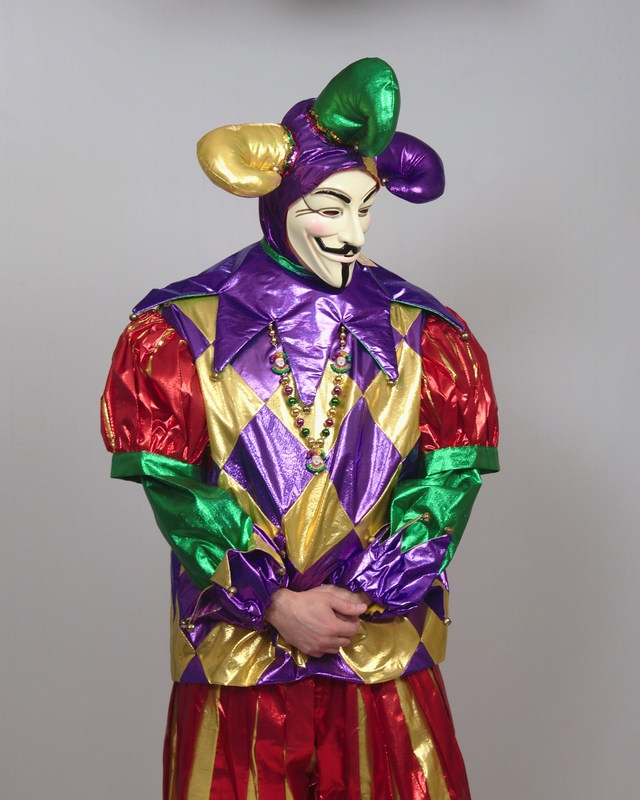 As you can see from my photo, I like to costume up as a jester wearing a Guy Hawkes mask when I DJ. So without giving too much away, I am preparing a live show that will be much like a Cirque du Soleil act with acrobatic dancers and such – perfect for EDC wouldn’t you agree? Anyway, it’s still in the planning stage and I’m hoping a live performance video will go a long way in giving people a better feel for what to expect. Other than that, I’m happy to just keep making dance music and meeting new people who share a similar passion.